Sqirl&apos;s Jessica Koslow (who recently put out a book you should devour), has just teamed up with salad purveyors Sweetgreen to create a "limited edition bowl." Koslow told LAist this morning, "Since Sqirl is only open for breakfast and lunch we wanted to partner with Sweetgreen to create a protein-packed version of our sorrel pesto bowl that diners would eat all day and into the night." 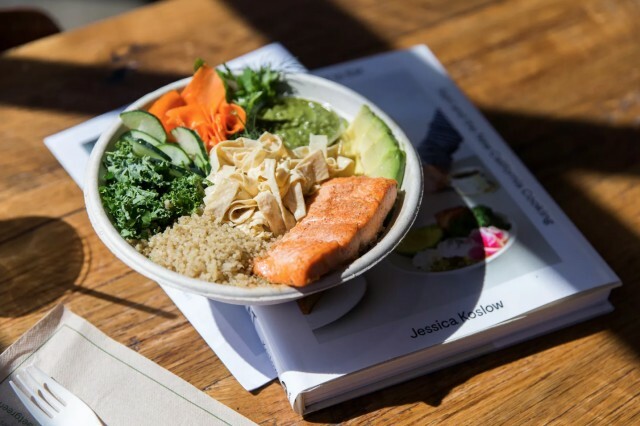 The Sqirl Dinner Bowl is served warm, and features (per Eater) "a blend of shredded kale, warm quinoa, avocado, roasted steelhead, tahini-marinated tofu skin noodles, pickled carrots, cucumbers, parsley, dill, basil, sorrel pesto dressing, and a fresh lemon squeeze." That sorrel pesto is a signature ingredient at Sqirl, and tops their Sorrel Pesto Rice Bowl, the restaurant&apos;s most popular dish. The bowl will be offered from October 13th through November 6th, and only at Sweetgreen (so no line). You can find their locations here (it will be at the West 3rd, Hollywood, and Santa Monica spots).